The booklet, which had a limited print run of 3,000 copies, highlights the connections between American and Soviet soldiers. One article tells the story of the first meeting between American and Soviet units at the Elbe River in central Germany. The troops literally rebuilt a bridge over the Elbe, proclaiming it “a bridge of friendship.” Another article focuses on the work of a New York archive that has preserved the stories Jewish Soviet veterans. The booklet also includes the story of American paratrooper Joseph Beyrle, who ended up joining the Red Army and fighting alongside new Soviet comrades, and promotes the project of an American foundation that hopes to retrace the historic Lend-Lease route from Alaska to Siberia this summer. The text in the center of the brochure explores how American and Soviet films influenced how the war was remembered on both sides of the Atlantic, turning “Brothers in Arms” into Cold War enemies. 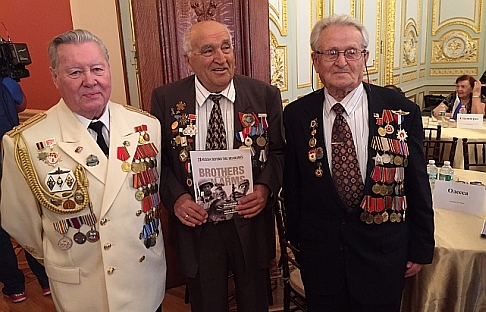 “Brothers in Arms” was distributed at several events held in the Russian Embassy in Washington D.C., the Russian Consulate in New York and at a photo exhibition at the United Nations. It was also made available to Russian Cultural Centers around the country and 30 American universities, including Columbia University and New York University. The booklet was also distributed at a meeting dedicated to Victory Day at the UN General Assembly on May 5 and 6 attended by Russia's Permanent Representative to the United Nations Vitaly Chirkin. The project was made possible with the support of the Blavatnik Archive Foundation and the Russian Cultural Center in Washington D.C.
“Brothers in Arms” can be downloaded here.